WR Jermaine Kearse vs. CB E.J. Gaines – The Jets were extremely thin at the receiver position coming into this season, which is why they traded for Kearse from Seattle. Though with that said, Kearse really struggled for the Seahawks in 2016. He ranked 93rd out of 96 qualified receivers in wide receiver rating at 57.5, and 88th in yards per route run at 0.95. That is why this opening matchup against E.J. Gaines is an interesting one, because Gaines struggled last season as well. He was 116th out of 117 qualified cornerbacks in passer rating at 139.1, and he was 109th in yards per coverage snap at 1.77. Both will be looking for bounce back seasons, and it will be a key matchup for both sides. T Brandon Shell vs. Edge Jerry Hughes – Shell had an outstanding preseason, as he finished third out of 52 qualified offensive tackles in pass-blocking efficiency at 98.1. In 79 pass-blocking snaps, he only allowed two total pressures. He will face off a good amount with Jerry Hughes, who had a solid 2016 campaign on the edge. Hughes was ninth out of 57 qualified 3-4 OLBs in hurries with 39, and 14th in total pressures with 50. He did however see his overall grade slip a bit, as after three straight years with grades of at least 81.8, his 2016 grade dipped down to 67.5. 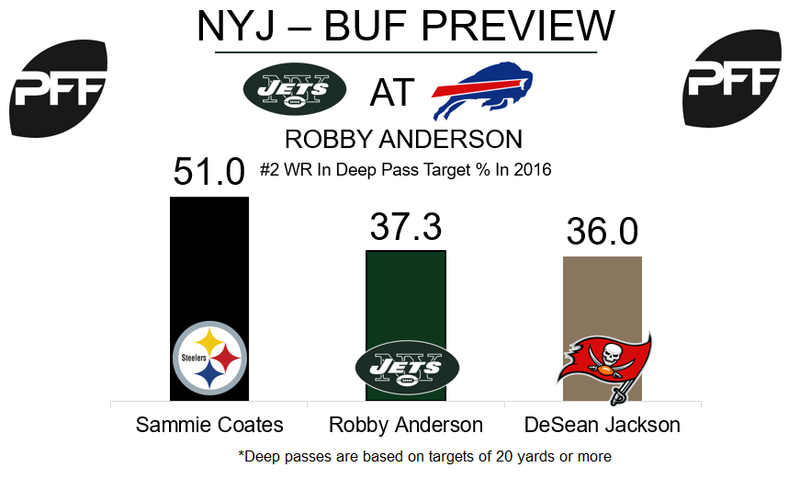 WR Robby Anderson vs. CB Tre’Davious White – Expect the Jets to target Robby Anderson often on deep throws in this game. Last season 37.3 percent of the balls thrown Anderson’s way were on throws of 20 yards or more. Out of 78 qualified receivers, only Sammie Coates had a higher deep pass target percentage. Tre’Davious White was Buffalo’s first round draft pick this year, as he is coming off a very good season at LSU. White only allowed a passer rating of 61.0 when targeted in 2016, and he had 12 passes defended. Expect the Jets to test White on deep throws early as he adjusts to life in the NFL. 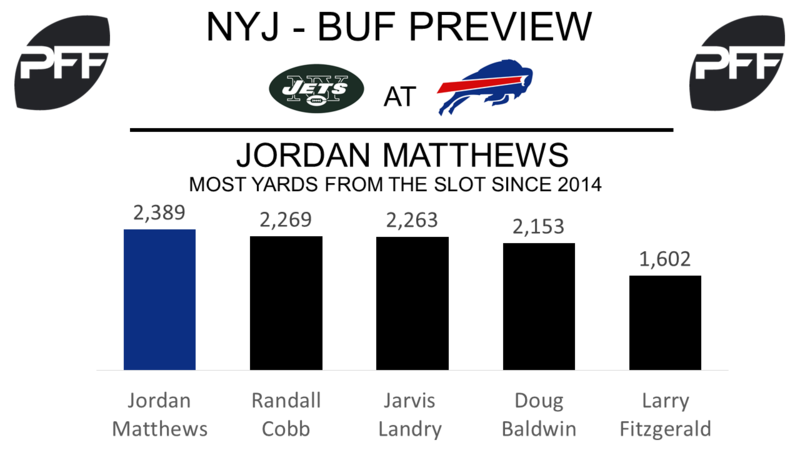 WR Jordan Matthews vs. CB Buster Skrine – The Bills newest receiver ranked as the 57th best receiver in 2016 with an overall PFF grade of 74.8. It is in the slot where Matthews is most dangerous. In 2016 Mathews caught 53 passes for 582 yards from the slot, both figures ranking inside the top-10 of slot performance. Since being drafted no wide receiver has more receiving yards from the slot than Matthews. Skrine will be the man charged with covering Matthews in the slot. Last season Skrine struggled mightily, as his overall grade of 45.5 ranked 89th out of 110 qualified cornerbacks. However he was very good in the slot, as he only allowed 0.83 yards per coverage snap, which ranked fourth out of 21 qualified corners. G Richie Incognito vs. DE Muhammad Wilkerson – If Buffalo are to win this game then it will be in the run game. The Bills were one of the best running the ball last season and that was due to some great run blockers such as Incognito. Last season Incognito ranked as the sixth-best guard with an overall PFF grade of 86.6 and was also the sixth-best run-blocking guard with a run block grade of 85.5. Wilkerson had his worst overall PFF grade since entering the league in 2016. His overall PFF grade of 49.1 ranked 89th among 110 qualifying edge defenders and his run defense grade of 46.6 ranked 79th. In 2014, Wilkerson ranked second among 49 qualifying 3-4 defensive ends in run-stop percentage at 11.8 percent, a mark that would have led the league in 2016. RB LeSean McCoy vs. LB Darron Lee – McCoy was one of the best receiving backs in the NFL in 2016, his receiving grade of 79.2 was the sixth best by a running back. On his 50 receptions last year he forced 18 missed tackles, the second most by a running back. On the opposite side, Lee was one of the most sure tacklers in the passing game as he only missed one tackle in coverage last year. His tackle efficiency of 23.0 in the passing game was the eighth best by a linebacker last season. Despite this he was one of the worst coverage linebackers in the league, his coverage grade of 36.8 ranked 74th out of 75 qualifying linebackers.